As of Nov. 4, 2010, AKC recognized us as Breeders of Merit, for our Irish Red and White Setters. Visit www.akc.org/breederofmerit for more information on this recognition. IRWS is of a Willie Gaynor - Maureen Cuddy collaborative. Copies are available for purchase. 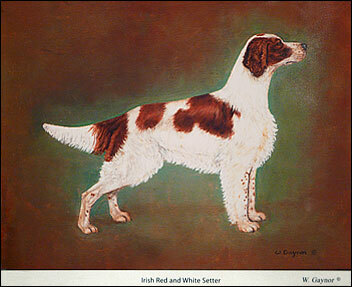 We are proud members of Ireland's Irish Red and White Setter Club and the Lake Superior Pointing Dog Club. We are members of the IRWSAA. Bob is past Vice President and Board member and is on the Judges' Education Committee. Evan is past Membership Chair.